Will Ryken and Jim Lowrey recently published “Smile if you have to,” a new book about the origin and evolution of Shambhala Sun Camp. The book is in three sections. The first section includes a bit of history, recounting the origin of the various camps and the early successes and failures of bringing the program into a stable format. The second section describes the camp schedule and the various activities that have become established over time. The last section, “The Ongoing Story,” notes a few of the more recent aspects of the camps. What follows are a few excerpts from the early chapters, with a few of the more than 200 color photos from the book. 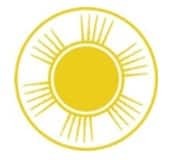 We should call them the Shambhala Sun. 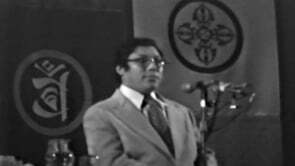 During the 1981 Vajradhatu Buddhist Seminary held at Chateau Lake Louise in Alberta, Canada, Rinpoche asked senior student Ken Friedman to spend some time with Rinpoche’s son Gesar every two weeks or so. Friedman, an experienced youth basketball coach, began working with Gesar at this seminary, and subsequently back home in Boulder. They were joined by some of Gesar’s friends, mostly Buddhist teenagers. 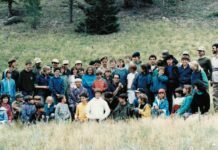 Friedman’s responsibilities carried over into a Buddhist teen program at the Rocky Mountain Dharma Center (RMDC), now Shambhala Mountain Center (SMC). SMC is in Red Feather Lakes, Colorado, about two hours north of Boulder. 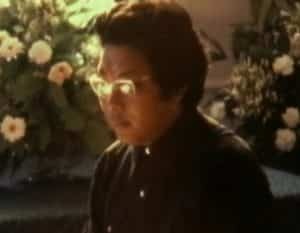 At that program, Friedman told stories of Tibetan yogi Milarepa and taught meditation to a dozen or so young people, while their parents attended adult programs. In addition to three hours of meditation, the program included instruction in Japanese arts, including flower arranging (ikebana), dancing (bugaku) taught by Sarah Cox, and martial archery (kyudo) instruction. 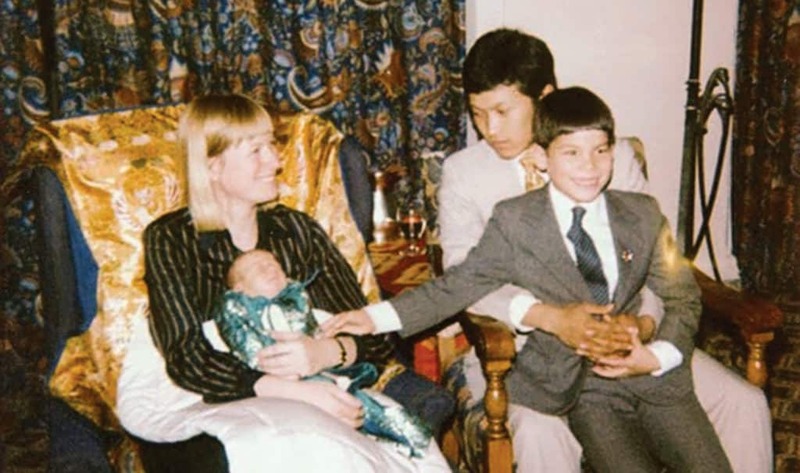 1981 Seminary at Lake Louise: Diana Mukpo with baby Ashoka Mukpo, the Sawang, Gesar Mukpo (in the Sawang’s lap). -Photo by Tony Bouret. Q: How do you tame a unique rabbit? A: You nique up on it. Q: How do you tame a tame rabbit? A: Tame way. You nique up on it. 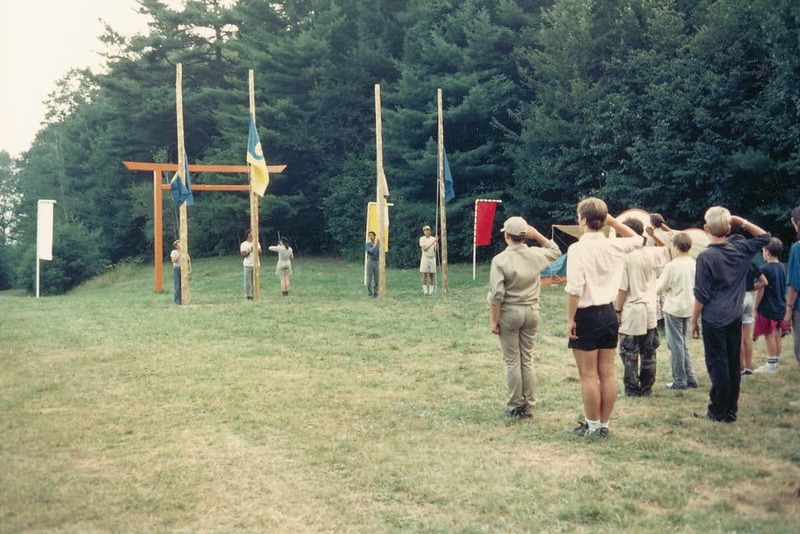 The first official Shambhala Sun Camp was held at RMDC (now SMC) in 1984 with 15 teenagers participating. It was staffed by Jim Lowrey, Will Ryken, and Matt Nowakowski. They arranged for outhouses to be delivered, food ordered (hot dogs and hamburgers, especially) and set up a large white tent as a shrine room. 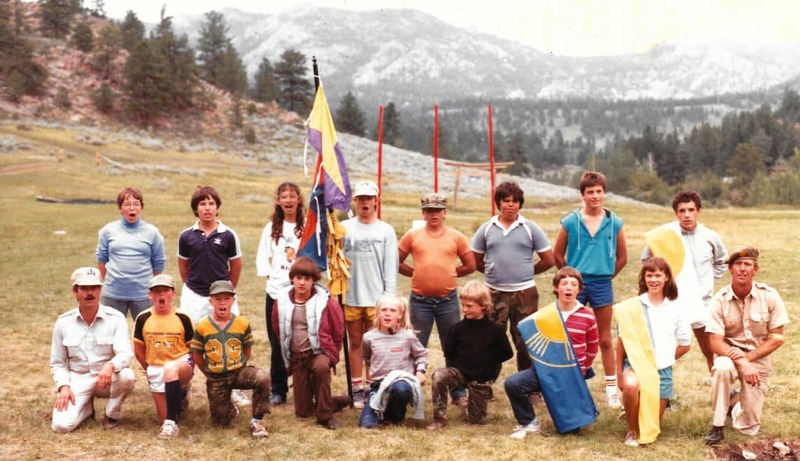 1984 SMC, first Sun Camp participants and staff (Jim Lowrey left front; Will Ryken right front). -Photo by Matt Nowakowski. In 1985, around 55 young people showed up for the second year. Ryken and Lowrey had learned a lot the first year and had a larger staff, including Alma Carpenter, Liz Craig, Paul Songer, and Heidi Mecklenburg, in addition to Matt Nowakowski. 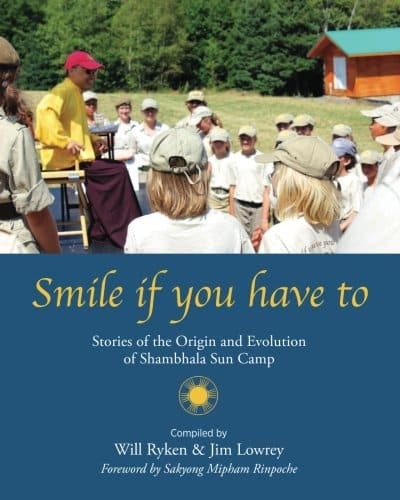 In Boulder, during their preparations for camp, James Gimian, apparently relaying a message from Rinpoche, told Ryken and Lowrey to just keep it simple and not have too much ambition, to just convey a sense of good head and shoulders. That helped them realize that they were planting some kind of homing signal that in the future, when they might get caught by setting sun darkness, would remind the warriors of home. So the staff’s job was simply to create an environment where they all felt at home. And as it has turned out, that seemed to work. The camp and the young warriors developed their own acceptance of each other no matter what their background. The Punks, Jocks and Nerds, and the Cool, Bad and Rebels all found a home at Sun Camp. Sometimes Ryken put trouble-makers or the lazy in a command position in order to tame and/or wake them up. That worked for the most part, but of course there were exceptions. 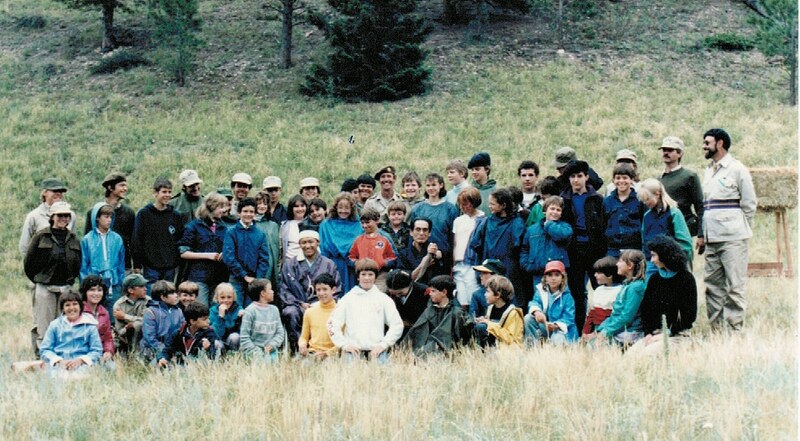 1985 SMC, participants, staff, and guests: Center: the Sawang, Kanjuro Shibata Sensei, Marsha Shibata; right: Ellen Mains, Michael Klarreich. If you lose your mind, come back. And when you’re back you’re here. 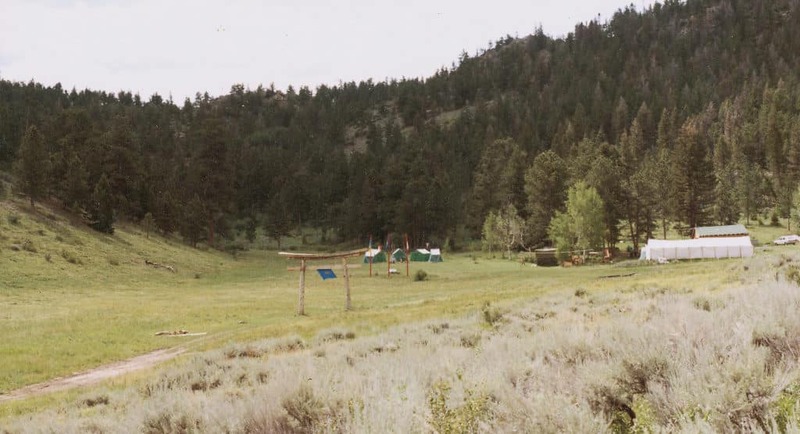 By 1986, the Sun Camp staff had learned that much advance planning was required, and as the applications for the 1986 camp poured in, they made sure that sufficient tents, food, outhouses, and so on would be there by the start of camp. Preparations continued up until the last minute. Driving to SMC from Boulder, Lowrey stopped at the Army Surplus Store in Fort Collins to buy kitchen supplies and more fire extinguishers. In fact, 120 young people arrived for the camp. Ryken and Lowrey realized that they had their hands full. They also needed to organize the campers into manageable groups. Following up on their experience from the previous year, but mostly from the MPE model, they set up a container comprising a strong schedule and a clear chain of command — with some significant differences. . . .
1986 SMC, the tent line and flags. That camp was highlighted by the campers approaching Ryken on the first day, saying that they did not want to follow along with the drill. They just wanted to hang out and play cards and Dungeons and Dragons. He told them fine! But they would have to help with cooking and cleaning. They went back to their tents and the staff relaxed in the command area. A few hours later, their representative, led by Andrew Sacamano, came back and said they would try the program out after all. Soon they discovered that they loved it.